FREE access to the electronic journal is a benefit of membership! Access keys are sent from the publisher, Springer, in early February annually and then periodically throughout the year as new members join. Please check your SPAM or Junk folder if you have not received your access token. If you are still unable to locate it, please contact the organization's secretary at secretary@ihpst.net. The official IHPST research journal is Science & Education. It is published by Springer and is now (2018) in its 27th Volume. The Editorial Committee is a distinguished group of forty science and mathematics educators, historians and philosophers of science, cognitive psychologists, scientists and philosophers of education. 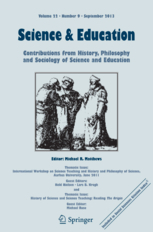 The committee members are drawn from fourteen countries; they include two past presidents of the US History of Science Society, five past presidents of the US Philosophy of Education Society, a former president of the US Philosophy of Science Association, and eighteen current or former editors of major international journals in science education, philosophy of education, and the history and philosophy of science. A feature of the journal has been the publication of thematic issues on important and topical subjects. Science teaching does not simply aim to transmit knowledge to students but, rather, to help them learn how to develop scientific explanations for natural phenomena, and also realize that their intuitive explanations are often insufficient. HPS scholarship has provided detailed analyses of the structure of scientific explanations that could provide coherent frameworks for teaching. Science & Education invites submissions on any aspect of scientific explanation that is relevant to science teaching and learning, including both theoretical and pedagogical aspects. b. Learning Progressions / Pathways about Nature of Science. Nature of Science (NOS) is a topic that has been a major focus of science education research over at least the past 20 years. Different perspectives have been developed and discussed. However, debates have focused mostly on normative issues with less attention on what aspects of NOS are appropriate for each educational level. Science & Education invites submissions on this topic from a developmental perspective, focusing on which aspects of NOS should be taught and could be learned at each educational level. Submissions from different parts of the world are strongly encouraged, in order to enhance appreciation of the similarities and differences of NOS education in different social and cultural settings. All submissions should be submitted for review directly to Editorial Manager. Thereafter they can check on its progress through the review process. Most submissions are reviewed by three senior scholars, usually involving a spread of educator, historian, philosopher or cognitive scientist. The submission site also has a guide to the journal’s format and style conventions. The following guidlines may be downloaded as a pdf here. You may view a sample submission in the proper format here. Please follow the journal’s style and format conventions. This greatly reduces subsequent editorial and copyediting work, and contributes to a more consistent and professional looking publication. Informed and competent reviewing is crucial to the integrity and quality of published scholarly work. It is a time-consuming, arduous and mostly anonymous and un-rewarded task, but publishers, editors, authors, readers, and the scholarly enterprise more generally, benefit and depend upon this unsung labour. Science & Education journal is noteworthy among education journals for having competent reviewers from the disciplines of Education, Science, Mathematics, Philosophy of Science and Mathematics, History of Science and Mathematics and Psychology. Manuscripts are usually reviewed by three scholars, and often by four, five or even more established scholars from different disciplines.